Moxidectin is a broad-spectrum antiparasitic active ingredient used in veterinary medicine in pets and livestock against external parasites (lice, mites, etc.) as well as against internal parasites (e.g. roundworms). It is not used against agricultural and household pests. It belongs to the chemical class of the macrocyclic lactones. Main veterinary parasites controlled: Gastrointestinal and pulmonary roundworms, lice, mites, horn flies; myiasis by screwworms, bot flies, warble flies, etc. Click here to view the article in this site with the most common dosing recommendations for moxidectin used in domestic animals. Learn more about moxidectin safety. In livestock: Yes, cross resistance with ivermectin, very frequent in gastrointestinal roundworms of sheep, goats and cattle. There are a few reports on cattle ticks (Boophilus microplus) resistance to ivermectin likely to show cross-resistance to moxidectin. Moxidectin is often initially effective against ivermectin-resistant roundworms. But resistance to moxidectin quickly develops as well if use is not interrupted rotating to another chemical class. In horses: Yes, cross resistance with ivermectin, in gastrointestinal roundworms such as Small strongyles (Cyathostomins) and Parascaris equorum. In pets: Yes, reported to ivermectin in heartworm microfilariae in the USA (so far particularly in Louisiana), with cross-resistance to macrocyclic lactones, most likely including also moxidectin. Moxidectin is a macrocyclic lactones obtained from fermentation products of the soil microorganism Streptomyces cyaneogriseus. It is a derivative of the milbemycins and not of avermectins as several other macrocyclic lactones (e.g. 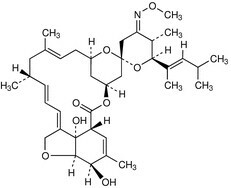 ivermectin). Moxidectin was discovered and developed by AMERICAN CYANAMID whose Animal Health business was taken over by FORT DODGE (WYETH) and later on by PFIZER (now ZOETIS). The original TM CYDECTIN is now marketed by different coompanies in various countries. The difference in efficacy between moxidectin and other livestock endectocides is rather small. This probably explains why there are thousands of generic ivermectin products, and only a few moxidectin generics. Generic ivermectin was available earlier than generic moxidectin, and for most uses on livestock ivermectin is good enough. Parasiticidal efficacy of moxidectin is quite similar to that of ivermectin. In livestock, moxidectin is effective against the major parasitic roundworms: gastrointestinal (e.g. Haemonchus spp, Cooperia spp, Ostertagia spp, Trichostrongylus spp) and pulmonary (e.g. Dictyocaulus spp). It is also effective most mites and lice species, and against numerous myiases (e.g. those caused by screwworm flies, bot flies and warble flies) usually regardless of the delivery form (pour-on, injectable, etc). However, at the usual therapeutic dose, moxidectin products are ineffective against livestock tapeworms and flukes, fleas, mosquitoes, horse and deer flies, stable flies and several other flying insects. Cattle horn flies are only incompletely controlled by pour-on formulations. Cattle ticks (Boophilus spp) are sufficiently controlled by pour-ons, but without knock-down effect, i.e. treated cattle need 7-10 days to become more or less tick free. Other ticks (e.g. Amblyomma spp, Hyalomma spp Dermacentor spp, Ixodes spp, Rhipicephalus spp) are not controlled at all by moxidectin products. Some studies indicate that injectable moxidectin at the usual dose (200 mcg/kg bw) is more efficient against sheep scab mites (Psoroptes ovis) than ivermectin. A single moxidectin treatment should be enough to fully control established infestations, whereas two treatments with ivermectin are required. In pets, moxidectin at the therapeutic dose is an effective heartworm (Dirofilaria spp) preventative and controls a few other roundworms as well (e.g. Toxocara canis, Ancylostoma spp, etc.). However, alone it is ineffective against pet tapeworms, flukes, fleas, ticks and flies. After absorption into blood moxidectin is well distributed throughout the whole body including target organs such as the gastric and gut mucosae. The highest concentrations are found in body fat that acts as a depot from where it is progressively released to blood. Moxidectin is more lipophilic than ivermectin and consequently it is stronger deposited in body fat, which results in a higher residual effect and a longer protection against several parasites than ivermectin (by comparable delivery form and administered dose). On sheep, the subcutaneous injection provides a significantly longer protection than the pour-on. As all macrocyclic lactones moxidectin acts as agonist of the GABA (gamma-aminobutyric acid) neurotransmitter in nerve cells and also binds to glutamate-gated chloride channels in nerve and muscle cells of invertebrates. In both cases it blocks the transmission of neuronal signals of the parasites, which are either paralyzed and expelled out of the body, or they starve. It also affects the reproduction of some parasites by diminishing oviposition or inducing an abnormal oogenesis.